To determine the clinical significance of incidentally discovered renal cysts in pediatric patients and identify imaging predictors of autosomal dominant polycystic kidney disease (ADPKD). 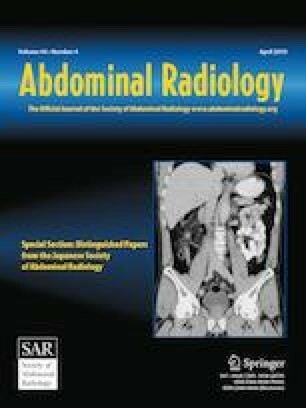 A retrospective search of radiology reports from 2000 to 2016 was performed to identify patients < 18 years old with an imaging exam identifying at least one renal cyst and a ≥ 1-year follow-up renal imaging exam for cyst evaluation and/or diagnosis of ADPKD. Cysts with clear solid mass components were excluded. 84 pediatric patients with renal cysts were identified (mean age, 9.5 years), including 76 patients with incidentally discovered cysts and 8 patients with cysts identified from screening for ADPKD family history. Among the incidentally discovered cyst group, 7.9% were found to have ADPKD compared with 100% of patients with cysts and ADPKD family history. Maximum cyst diameter was significantly increased in patients with ADPKD compared to patients without ADPKD (22.0 mm vs 12.7 mm; P < 0.001, Fisher’s Exact test). Multiple cysts or bilateral cysts were imaging features associated with a significantly higher (P < 0.01) incidence of ADPKD, both for the entire study population and the incidentally discovered cyst group. An increase in cyst size on the follow-up study was associated with higher incidence of ADPKD (P < 0.05). No malignancies were identified. Incidentally discovered renal cysts in pediatric patients are associated with a small but non-zero risk of ADPKD. Among cyst characteristics, bilaterality, multiplicity, large size, and increased size on follow-up imaging were associated with a statistically significant elevation of ADPKD risk, and should prompt diagnostic evaluation. Ariel Botwin and Teerasak Phewplung have contributed equally to this work.